ENOVA is a public enterprise owned by the Royal Norwegian Ministry of Petroleum and Energy. It advises the ministry in questions relating to energy efficiency and new renewable energy. One of their services is the practical development of energy and climate plans (Kommunal energi- og klimaplanlegging) for Norwegian municipalities. On their website they present a sample Sankey diagram to visualize energy flows. 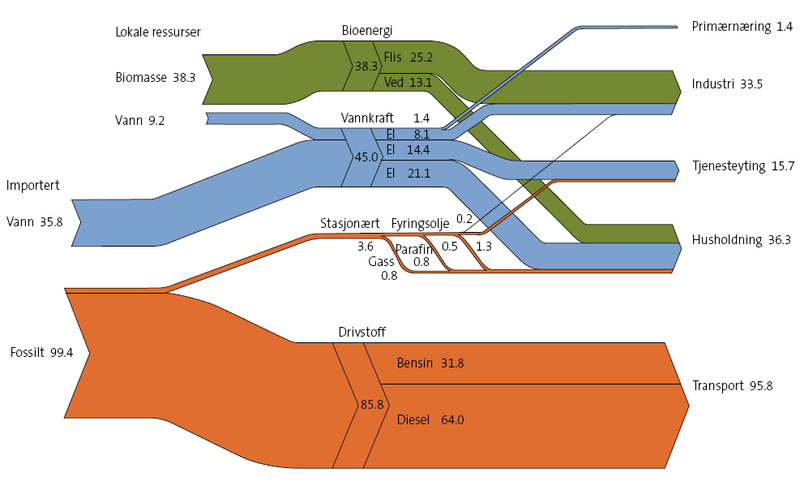 The Sankey diagram shows the energy flows in the Stor-Elvdal municipality in GWh (probably per year, a year is not given). This is very interesting, as the municipality can cover almost all of its energy for industry and private households from renewable energy sources, such as biomass and wind. Energy from fossil sources is consumed through almost entirely transportation. Stor-Elvdal produces 47.5 GWh within the municipality, and imports another 35,8 GWh from wind from outside the municipality. A small typo can be found in label on the the orange flow (saying 85,8 where it should read 95,8), but this doesn’t spoil the overall quality of this diagram painted with SDraw, I guess. Hi, your blog on sankey diagrams is very informative with a lot of samples. I would also like to see a sample of sankey diagram used in energy auditing. Maybe a diagram showing the enrgy iput to a boiler and the various energy flows. I particulary need sankeys on energy management as I am studying the subject.